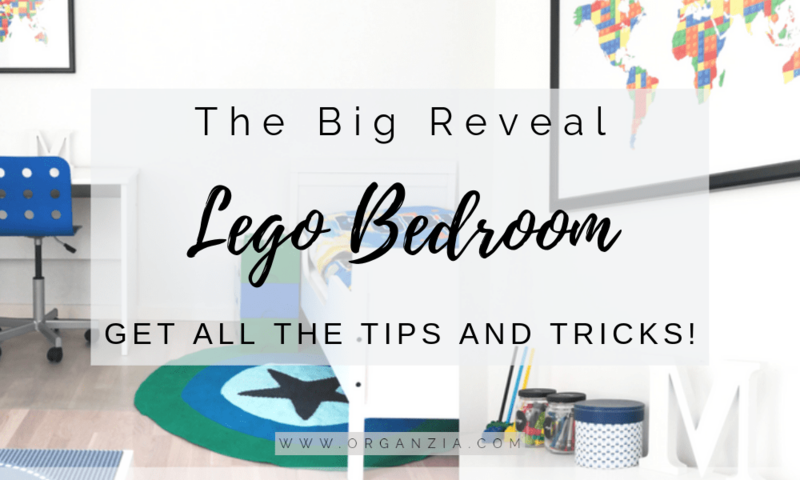 Lego bedroom, time for the reveal and all the details! I’ve posted so many Lego related tutorials that I’ve done for my son’s bedroom, now it’s time for you guys to finally see the finished Lego bedroom! I really need to get more storage, but everything else is pretty much done. We redid this room when we moved into this house. The room actually used to be two small bedrooms, but we decided to knock down the wall so that he could get a really good sized bedroom. My son is one of the biggest Lego fans ever, he eats, sleeps and breathes Lego! So it wasn’t really much of surprise that he wanted to have a Lego bedroom. There are so many amazing pictures of Lego bedrooms on Pinterest. 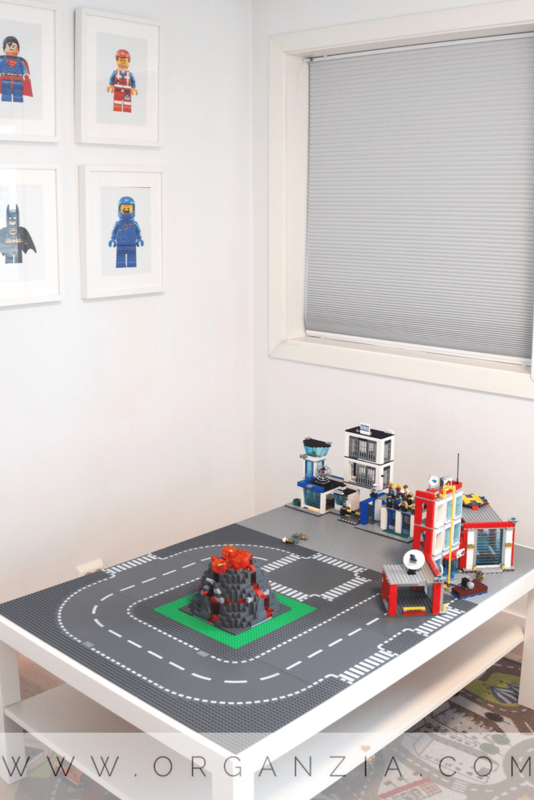 Many of the bedrooms on Pinterest have large Lego wall stickers/murals and are painted in the typical Lego colors. 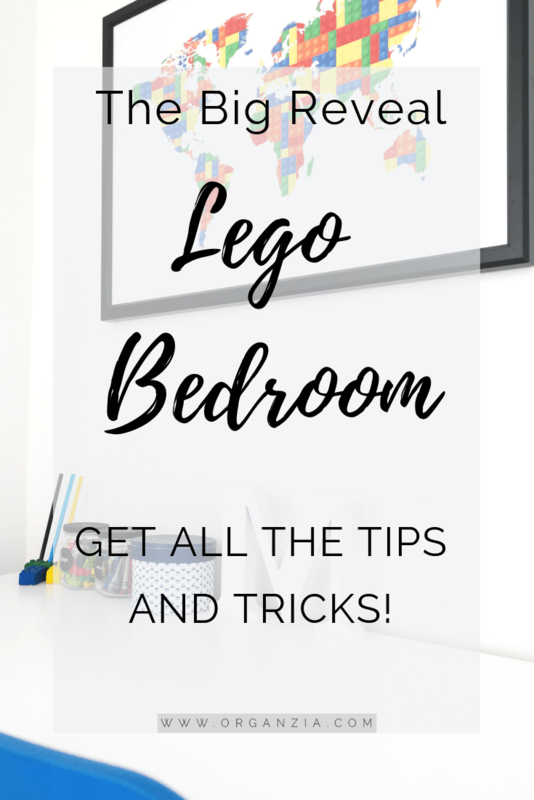 There’s really so much you can do if you want to make a Lego bedroom, you can really be creative! Personally, I really like to keep the room walls and flooring pretty plain.We wanted to keep that Scandinavian styled room feeling and only painted the walls in a nice white color and went with a light colored oak hardwood floor.I usually prefer to rather add colors and details, in the furniture and accessories in the room. Especially when decorating kids room! So let’s get down to the details of how I created this Lego bedroom! I really wanted to focus on the classic Lego colors, blue, green and some hints of red. These clear colors really pop when added to a white surrounding. My son, he loves the NEXO Knights Lego Characters. He was just over the moon when he saw that I bought him this Nexo Knights Duvet Cover Set. I also found these cool LEGO Storage Bricks. These are so much fun and great for storing Lego of course, but also other small toys. The storage boxes can be stacked (actually just like huge LEGO!) and they come in various kinds of colors. We use two of the large size storage boxes on the bottom and two of the small-sized storage boxes stacked on top. This works great both as a storage unit and as a nightstand. For extra storage, we use a small storage unit from Ikea (KALLAX). I like this storage solution because you can choose to use only bins or containers, or like we did ad extra drawers. It also works great for showing off some Lego masterpieces! He just started school last year, so he really wanted to have a desk for doing homework in his room.The desk is also a perfect place to add some extra Lego decor! If you’re looking for some easy Lego DIY projects to do with the kids, check out my tutorials for the Lego Pencil Holders and Upcycled Glas Storage Jars. 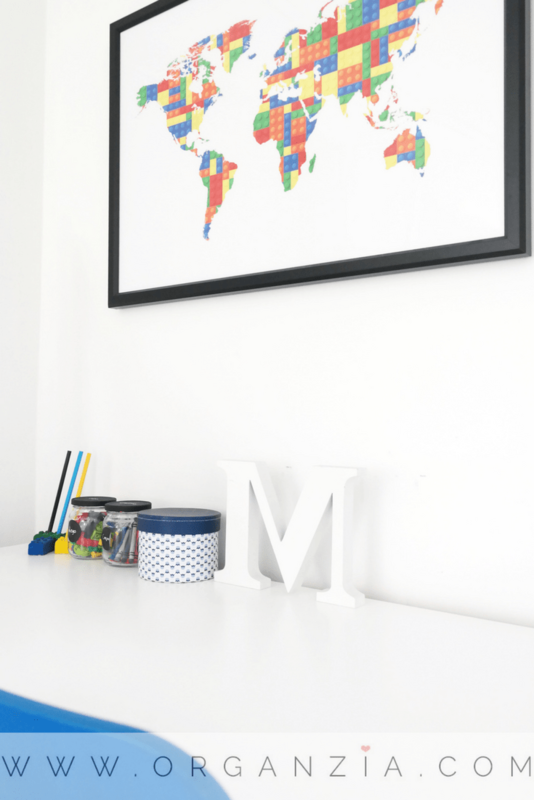 Printables are always an easy way to bring some colors to plain walls. 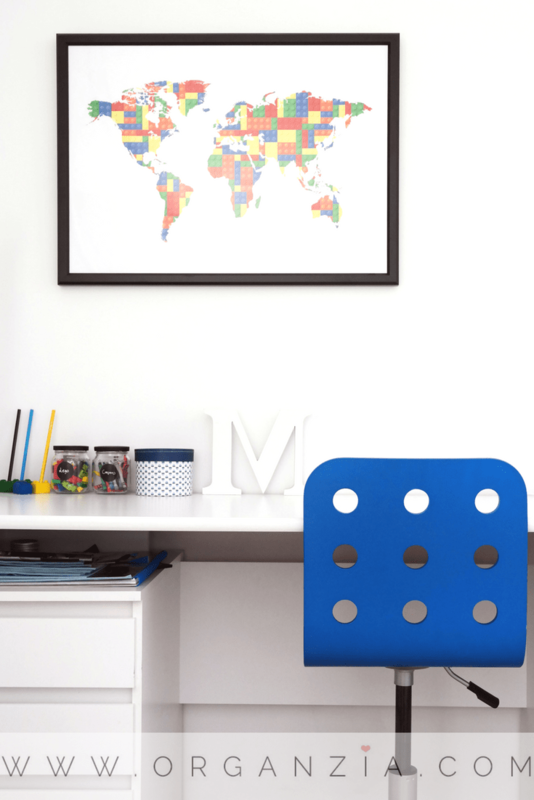 I got this printable LEGO World Map, that I framed and hung up over the desk. I surprised my son with this Lego table, not long after we moved in. He just loves this table, and he has played with it every day since the first day he got it. Perfect for having friends over and playing with Lego for hours! The kids love it, and everyone usually ends up playing around the Lego table. If you would like to make your own Lego table, you’ll find the step by step tutorial here. 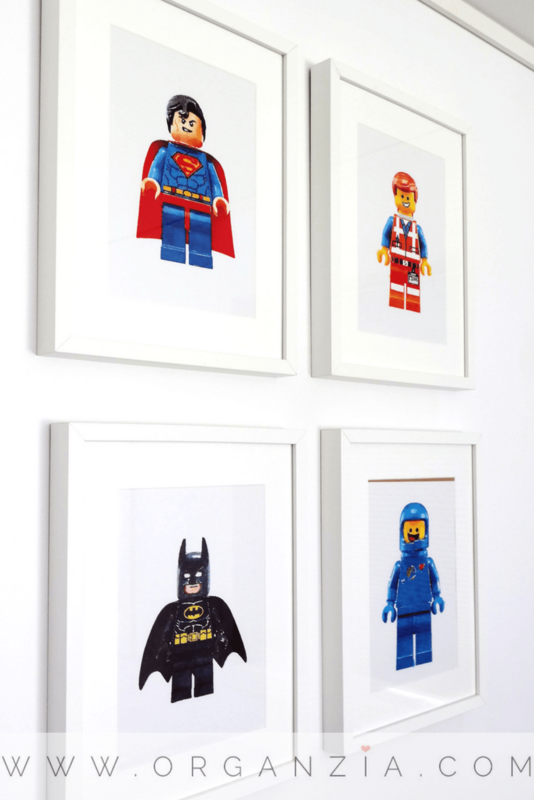 Love this Lego print set! I bought this a while ago but unfortunately, they’re no longer available. If you’re looking for similar prints check out Etsy! A few years ago I was looking for birthday supplies for my sons birthday when I accidentally stumbled upon a listing on Etsy.It almost felt like I entered a new world of all these awesome printables! Well, that was pretty much it! Hopefully, you liked this post, and maybe got some ideas for decorating a Lego bedroom. The room turned out great! I LOVE the LEGO pencil holders and the storage jars!